Porcupine Mountains Wilderness State Park is 15 miles west of Ontonagon in Michigan’s Upper Peninsula. The park’s 60,000 acres are one of the few remaining large wilderness areas in the Midwest. Towering virgin timber, secluded lakes, and miles of wild rivers and streams make a visit to the “Porkies” a trip to remember. As Michigan’s largest state park, planning your trip may require the use of various maps. Links to these important maps are provided below. 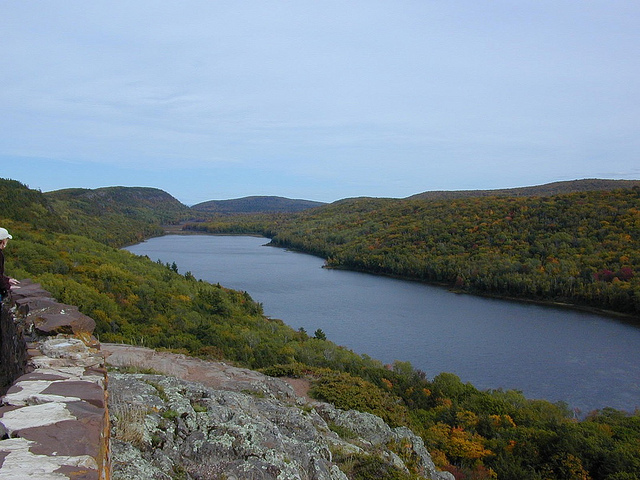 The Porcupine Mountains Wilderness State Park was established in 1945 by Michigan’s Legislature. Since then, many changes have taken place in the way we live; however, the Porcupine Mountains are almost unchanged. The remote interior with its towering pine and hemlock seems to defy time. The solitude of the park is mysterious and exciting. As Michigan’s only state designated wilderness, the Porkies is partnered with Leave No Trace ethics and has developed manuals for specific uses. For wilderness use manuals, please click the links below. A hiker to the interior of the Porkies must actually turn back the clock and call on skills that were second nature to our ancestors. One must appreciate the ways of a wilderness area to thoroughly enjoy backpacking the Porkies. Remember: the difference between tired feet and the satisfaction of an outstanding view is mostly a condition of the mind. Black bear are frequently encountered in the park. When backcountry camping, bear bags must be suspended at least 12 feet above the ground and far enough from the tree to prevent an animal from reaching or jumping on it. Never feed wild animals. Feeding wildlife damages their health, alters natural behaviors, exposes them to predators and other dangers, and causes them to lose their natural fear of humans. Below are the latest postings from the Porcupine Mountains Wilderness State Park Page On Facebook. Porcupine Mountains Wilderness State Park - the Porkies Porcupine Mountains Wilderness State Park - the "Porkies" shared a post. Due to last nights warm temps and rain we are sorry to announce that we will not be open today and that our season is over. We groomed the hill last night and it's looking like a great day to get some end of the season runs in! Thank you so much for sharing. I would love to know where these videos are located on the web or YouTube, so I could share them with a friend who isn’t on FB. He grew up there. Love those old travel films. They used to have them on Saturday afternoons before big money sports took over tv. This tape reminds me stories on American Sportsmen.